While using aggressive chemicals, it is vital that the correct work gloves are worn. For the best chemical resistance, the AlphaTec range should be a number one choice. The Ansell AlphaTec 38-514 Butyl Chemical-Resistant Thin Gauntlets protect particularly well against aldehydes, ketones, acids and mineral acids, while providing outstanding grip in wet and oily conditions. 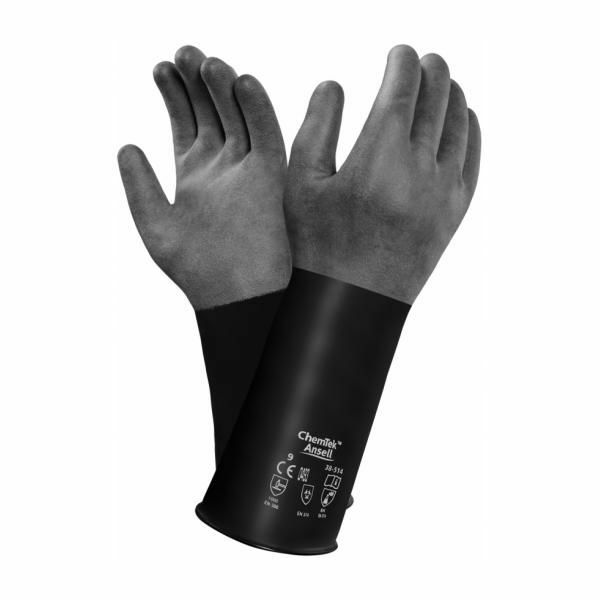 Excellent for chemical resistance, the Ansell AlphaTec Gauntlets are also available in a thicker size. The Ansell 38-514 Chemical Resistant Gauntlets are available in five sizes that should suit the hands of most users. Please measure the circumference of your hand around the knuckles (excluding the thumb) with your hand open and your fingers together, and the length of your hand from the tip of your middle finger to your wrist.